A classically styled figure based on the Venus de Milo. Dine has removed the head, which serves to "reduce the sculpture's specificity and eliminate the implied narrative carried by recognizable features." All the other major elements of the Venus de Milo have been preserved: the contrapposto posing, the legs on different planes, and the arms lost to history. By making references to one of the most iconic pieces in antiquity, Dine has reinvigorated and reinvented High Classical art like so many before him. His piece bears signs of the artist all over it. Cuts in the original clay, scrapes, rakes, contusions, and the like all catch the light from the sun setting across the Cuyahoga River and give this piece a completely unique silhouette among the thousands of similar statues throughout history. The statue's installation outside the Carl B. Stokes Courthouse was a choice made by the chief architect, Michael McKinnel. The design of the building itself hearkens back to Classical architecture, but not in the traditional palatial sense. Rather, the Courthouse references the forms found in columns from Antiquity. The building is formed generally by a base, a shaft, and a capital. Including a massive and direct representation of Classical tastes creates a dialogue between the building and the sculpture that intensifies the impact of both. 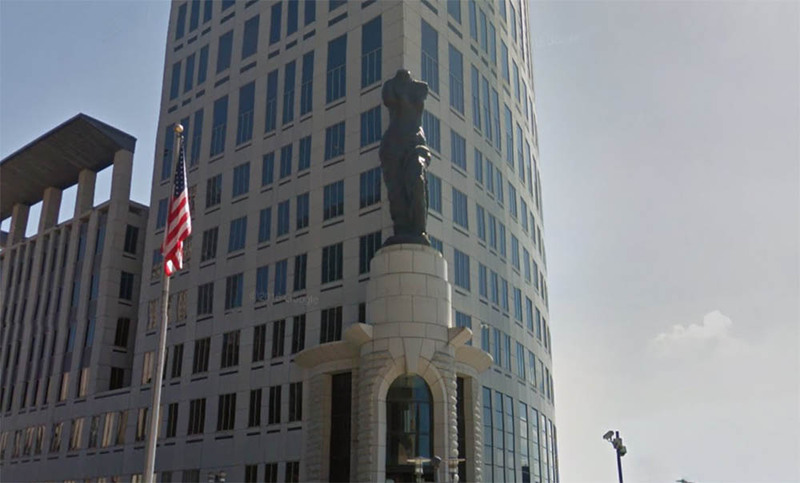 : Jim Dine, “Cleveland Venus,” Ohio Outdoor Sculpture Inventory, accessed April 20, 2019, http://oosi.sculpturecenter.org/items/show/1277.